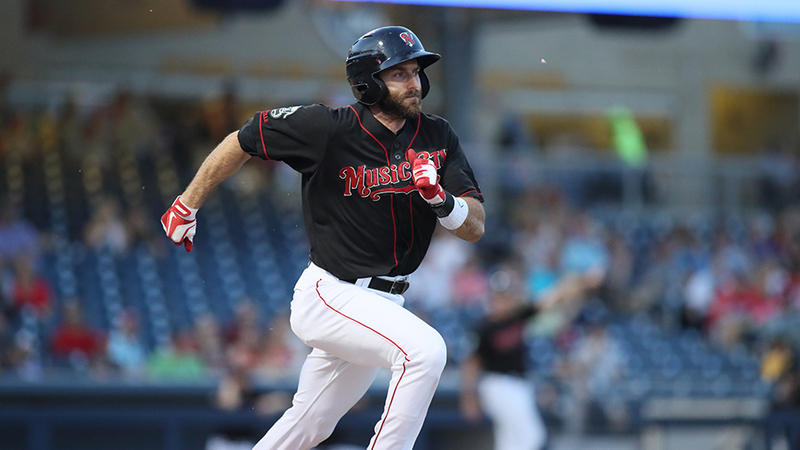 METAIRIE, Louisiana - The Nashville Sounds wrapped up the road portion of their 2018 schedule in heart-breaking fashion Thursday night as they fell to the New Orleans Baby Cakes 5-4 in 10 innings. Chris Bostick's two-out single in the 10th secured the victory for New Orleans. Metairie native Jeremy Bleich pitched the 10th inning for the Sounds and took the loss as he allowed a walk and a base hit in the final frame. Bleich induced a fielder's choice, which retired the designated runner trying to advance to third base to begin the game. He then walked Christian Adames and two batters later surrendered the game-ending base hit to Bostick. After being shut out Wednesday night, the Sounds lit up the scoreboard early Thursday night. After Beau Taylor reached with a bunt single in the first inning and moved to second on a wild pitch from Sandy Alcantara, Steve Lombardozzi stepped up to the plate. Nashville's first baseman pulled a base hit to right field to score Taylor from second. The Baby Cakes scored in three straight innings. They tied the game in the fourth inning when Peter O'Brien took Sounds starter James Naile deep. A lead off walk came back to haunt Naile in the fifth inning. Braxton Lee the stole second base and two batters later scored on a Peter Mooney base hit. Two runs scored in the sixth inning highlighted by O'Brien's RBI double. The Sounds briefly took the lead in the sixth inning as they sent nine batters to the plate and scored three runs, two on an RBI single from Matt Joyce and one from BJ Boyd. In his first start since returning from Double-A Midland, Naile issued a career-high four free passes and yielded four runs on seven hits. The Sounds threatened to take the lead in the seventh, eighth, and 10th innings as they put a runner on third base with less than two outs. On all three occasions the New Orleans bullpen was able to wiggle their way out of the jam. The Sounds return home for the final series of the season. Game one of their four-game series against the Memphis Redbirds is Friday night at First Tennessee Park. Right-hander Chris Bassitt (5-5, 4.35) starts for the Sounds against left-hander Austin Warner (1-1, 3.73) for the Redbirds. First pitch is scheduled for 7:05 p.m.
-With tonight's 5-4 loss, the Sounds dropped to 70-66 on the season. -Nashville is now 9-6 in extra-inning games this season. -The Sounds finish the 2018 season with a 31-39 road record. -Boog Powell extended his hitting streak to seven games with a single in the fifth inning. The 2018 season is the Sounds' 41st in franchise history and fourth as the Oakland Athletics' top affiliate. Single-game tickets are available now by calling (615) 690-4487 or by visiting www.nashvillesounds.com.